Is there a better alternative to Collins Gem Russian Dictionary? Is Collins Gem Russian Dictionary really the best app in Language category? 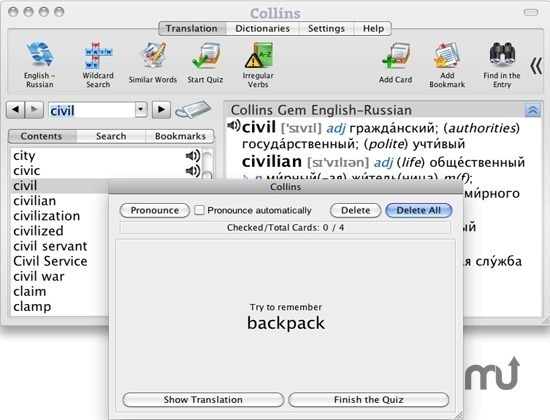 Will Collins Gem Russian Dictionary work good on macOS 10.13.4? Collins Gem Russian Dictionary ... Fully revised and updated, this latest edition from Collins’ bestselling Gem Dictionary range is the perfect choice for anyone needing a portable up-to-the-minute Russian dictionary. The Collins Gem Russian Dictionary has been designed to give travellers, students, business people and the general user alike all the information they need in a handy, take-anywhere format. Version 7.5: Release notes were unavailable when this listing was updated. Collins Gem Russian Dictionary needs a review. Be the first to review this app and get the discussion started! Collins Gem Russian Dictionary needs a rating. Be the first to rate this app and get the discussion started! All the latest words in both languages, such as downloadable, Wi-Fi, carbon footprint, podcast. Useful tables of nouns, verbs, pronouns and numerals. Helpful examples and cultural note. Special treatment of difficult word. Dictionary database contains over 22,000 keywords. Russian sound module contains over 10,000 entries by native speakers. English sound module contains over 10,000 entries by native speakers. Comprehensive coverage of today's Russian and English. Special treatment of frequently-used words. Find the list of irregular verbs for English dictionaries.